Why is the CSMI needed? There is a large tract of land spanning the Eastern edge of the City of Calgary, the City of Chestermere, the Town of Strathmore, Rocky View County and Wheatland County where there are limited natural drainage courses to effectively transfer stormwater. Ongoing development in these communities, which are adjacent to and surrounding the Western Irrigation District (WID) irrigation system, has been accelerating stormwater management challenges in the area. This includes creating ongoing maintenance and water quality challenges for the WID and limiting the available options for new developers to safely move runoff away from their properties. There is a need to develop a long term, sustainable solution for stormwater management that facilitates municipalities to grow and develop land, while maintaining water quality in the irrigation system that supports a vibrant agricultural economy and the long-term health of nearby water resources. In 2012, the Western Irrigation District responded to this need and spearheaded an effort to bring together five partner municipalities to develop a regional stormwater solution, now known as the Co-operative Stormwater Management Initiative (CSMI). Recognizing a shared responsibility for the system’s current challenges, the municipalities surrounding the WID have come together as the CSMI to proactively collaborate in developing sustainable stormwater solutions that will accommodate equally the needs of all interested parties and the environment. The Western Irrigation District (WID). Alberta Environment & Parks (AEP) participates as an observer. WaterSMART Solutions Ltd. (Alberta WaterSMART) is the facilitator and advisor. MPE Engineering Ltd continues to support the project’s engineering requirements. Dentons Canada LLP provides legal services, including development of key Agreements needed to implement the CSMI governance principles. In winter 2018, the CSMI Master Stormwater Agreement was signed by all six partners, committing the group to proceed with development of subsequent Agreements for Development, Management, and Use of the stormwater system. These Agreements, which must be ratified by all partners to take effect, are essential for defining how the CSMI system will be built, managed, and used by the partners. Partners intend to complete these Agreements by February 2019 as per the CSMI Master Stormwater Agreement. Stormwater drainage solutions are needed for the CSMI region because there are limited natural drainage courses to effectively transfer stormwater. After several years of collaborating, innovating and completing engineering assessments to determine how to collect and treat stormwater before it is returned to rivers, it was decided that the most feasible option for developing a regional stormwater system is an “out of canal” option. “Out of canal” means that water is kept out of the WID irrigation canals and flows through an independent system. This solution combines existing and new infrastructure to divert stormwater runoff away from the irrigation system, treat it as necessary through stormwater Best Management Practices (BMPs), and eventually release it to a natural water course. Meets or exceeds regulatory standards for water quality and quantity. 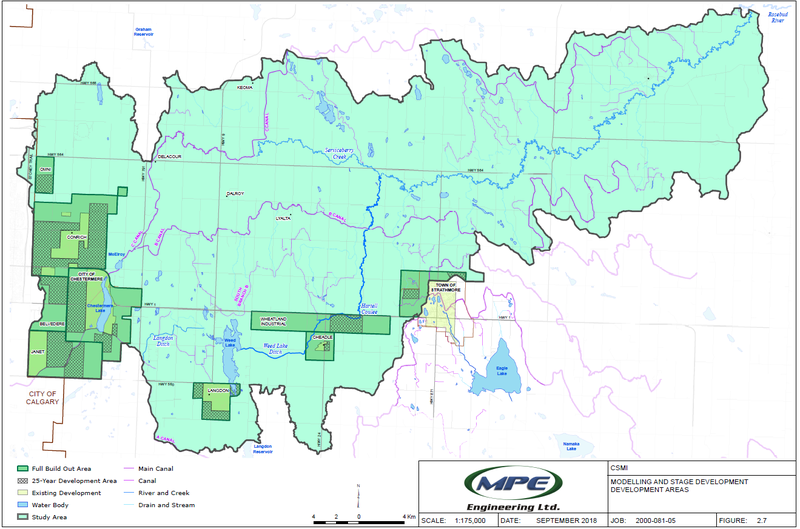 Meets outlet standards for eventual release to the South Saskatchewan River Basin. Ensures that new and existing infrastructure are thoughtfully integrated into a regional system. Adopts a collaborative and fair approach to management and funding of the system based on relative use of the system. Is developed in phases, using a transparent and fact-based process. In addition to the above stormwater benefits, the CSMI is a unique project that will provide a process for ongoing collaboration between municipalities and the irrigation district for decades to come. Water flows across political boundaries, bringing people and organizations together to manage one of our most valuable resources. The relationships built throughout this collaborative process will support continued economic growth, a vibrant agricultural economy, and the long-term health of regional water resources. The map below shows the boundaries of the areas that were studied when determining the potential needs and benefits of the CSMI. The boundaries shown on the map are conceptual and subject to change once the CSMI partners begin engagement and consultation with specific landowners in the CSMI region, complete the final design and apply for regulatory approval. Click to clarify and enlarge the photo.